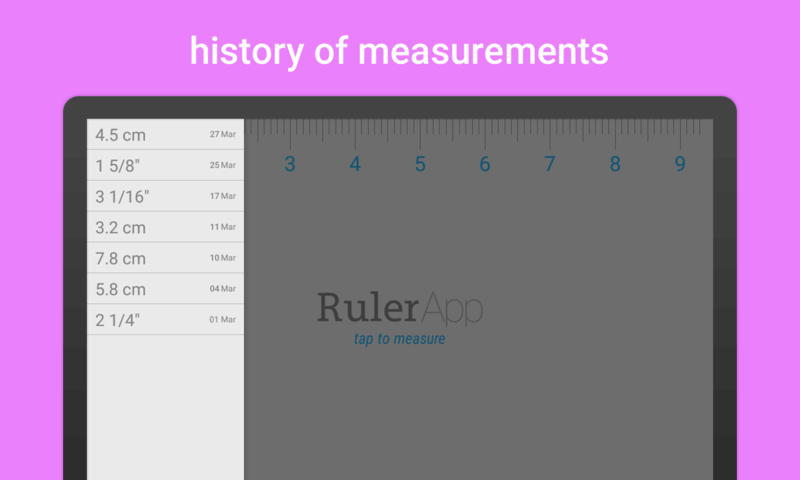 Ruler app for your phone and tablet. 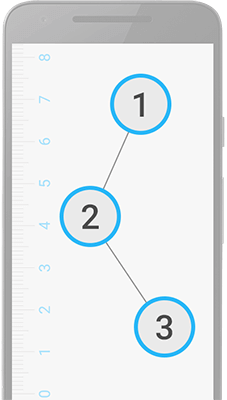 Measure every length with beautiful on-screen ruler. Tap the screen to start using the best multi-touch measuring system and find size of all curious objects around you. And all this for free. How to measure an object with your phone. Need to find the length of some object? Don't know where your meter is? Here is a simple solution to this problem. Open Google Play store on your smartphone, tablet or computer and search for "ruler app" or click here for direct link. Install the application on the device, it will take just a couple of seconds and will not take much space. The download is only 1.5 MB. 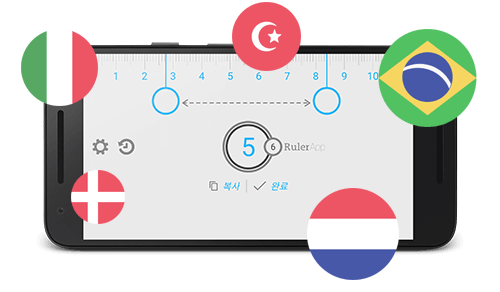 Open Ruler App and choose your prefered units of measurement - inches if you live in the States and use Imperial system or centimeters if use Metric system. You will see the main view with a ruler on it. Put desired object on top of the screen and find it's size. 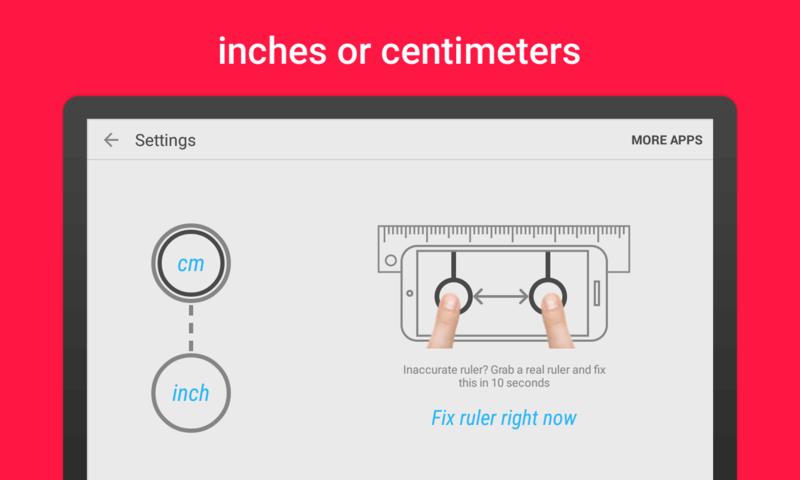 You can also measure the exact length by clicking the screen and move the two handles like you use a caliper. When ready click "done" button to save result to the measurement history. And you are ready! So simple that everyone can use it with just a single tap. Beautiful modern design with fast and responsive interface. This application is only 1.5 MB to download. You should always have space for it. Possibility to adjust ruler accuracy for amazing measuring results. Use Imperial or Metric units system? Choose from inches or centimeters from the settings menu. 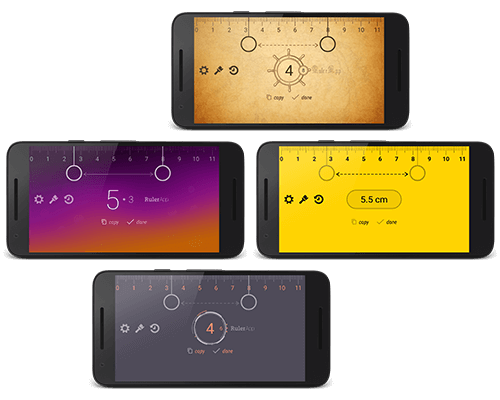 The tape measure application fully supports fractions display for users in the United States. You can also find out the size in the other unit system by quickly changing units. Save every length to the history of measurements. Then you can assign it a title and also restore the size on the screen. Long press an item and you can delete it or share it with friends. Your history is available with a tap on a button or just a simple swipe from the left edge of the screen. The application now offers six new fancy themes. In addition to the classic skin, you can choose from mystic Space, stylish Modern, handy Night, adventurous Pirate, ancient Wooden or everyday Plastic. This mobile application is designed to work on any Android device on this planet. No mather phone or tablet, new or old, you will be able to install and use it. It is translated in more than 40 languages so for sure it is available on your language. Touch the screen to begin precise measuring. Use your both fingers to move handles around a small object to find its size. 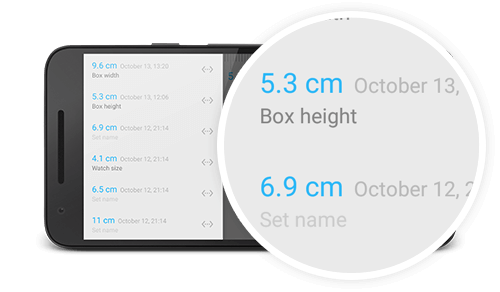 When ready, you can save the result to the history of measurements or copy the value to the clipboard and share it with other applications. 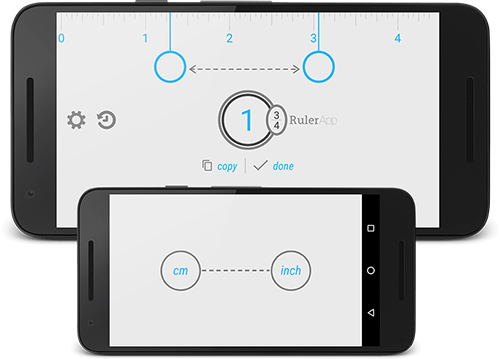 See the beauty of Ruler App before you download it. Then go download it on your device. 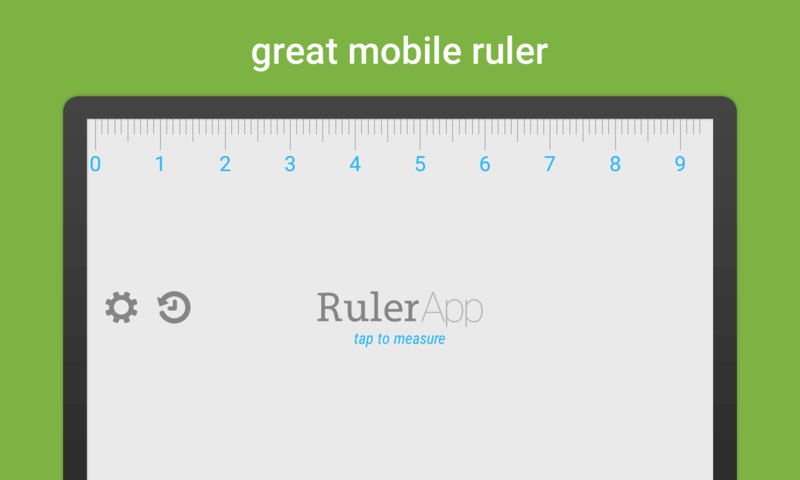 A lot of web sites and blogs already made reviews about Ruler App. We know how hard it is to prepare all the screenshots, to find icons and graphics and aditional information. To help you we have made a great compilation of resources for you to start. 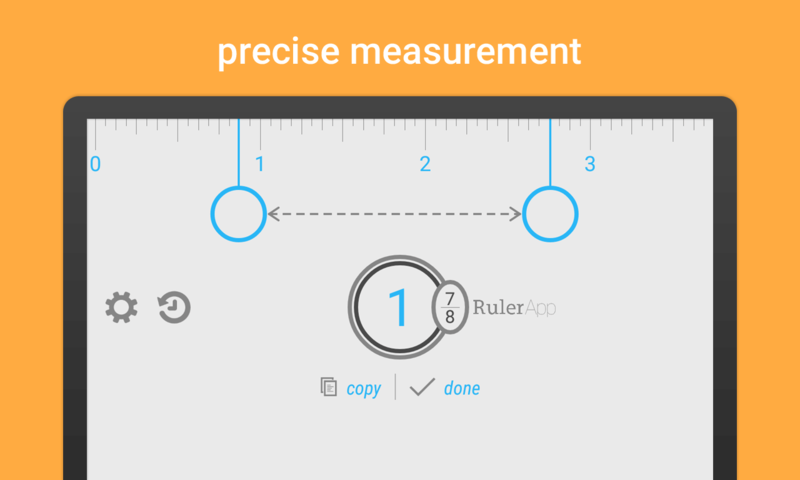 If you want to make a review about Ruler App, here you can download a simple presskit. It contains logos, icons and screenshots to help you writing. Our Facebook fan-page has now more follower than ever. If you need more information regarding our tool and find interesting what's new about it, enter and enjoy. If you wish, leave feedback and rate us on Google Play or contact us by email. Nikola Kosev is the author of this outstanding software. Check out his latest projects and find more stuff about him on kosev.net.